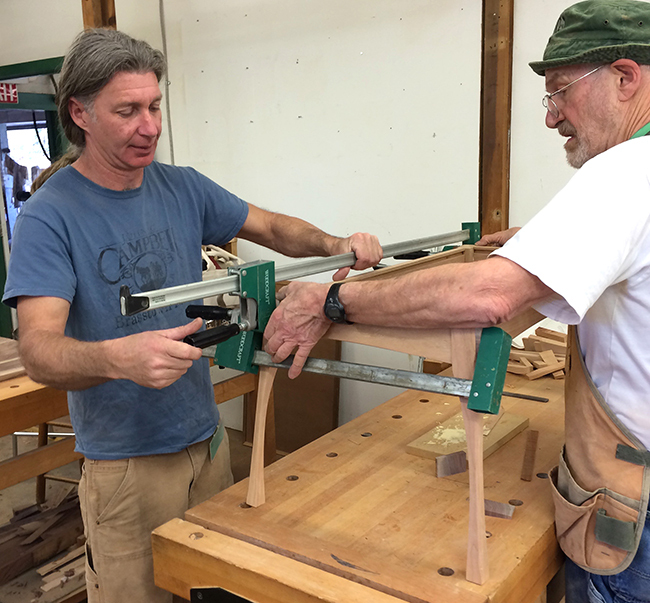 John Campbell and a student adjust clamps on the glued table frame. Building a beautiful and functional object that you use in your everyday life is so satisfying. 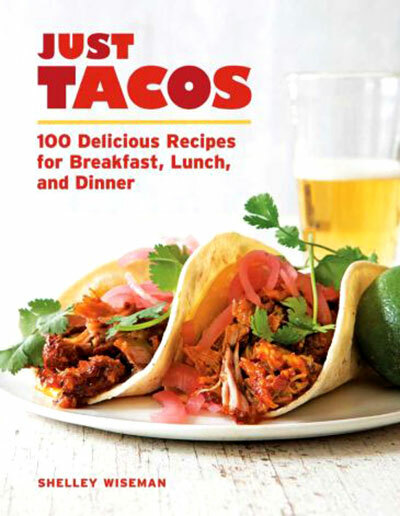 Plus, it definitely gives you some hefty bragging rights. I once built a chair in Lyle Wheeler’s ladder back chair class (using only hand tools!). When you experience the hard work and skill that goes into a piece of furniture, you are forever reminded of the process and your satisfying experience as a builder. 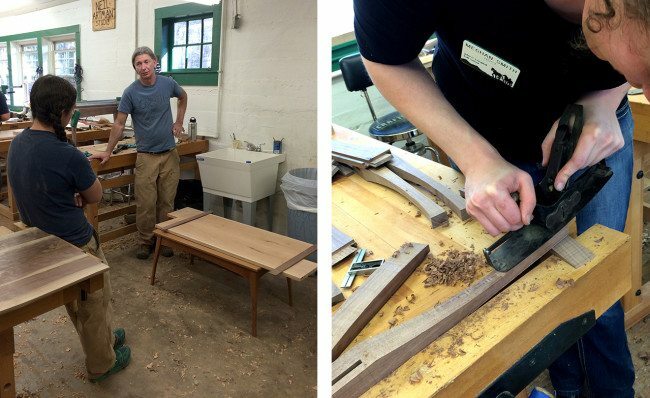 Recently, I stopped by a new furniture-building class taught by John Campbell. The woodworking class focused on the creation of a contemporary coffee table based off of John’s prototype. During my mid-week visit, I saw students working in various stages of the process. Meghan wielded the power of the plane, while Lynn Ann and Katie used power sanders on the porch. Other students were gluing, measuring, or considering design options. The class used a mixture of power and hand tools giving students the opportunity to learn skills translatable to their toolboxes at home, while also being able to use and learn about professional tools in a state of the art shop. Student use power tools and hand tools to sculpt and sand table pieces. 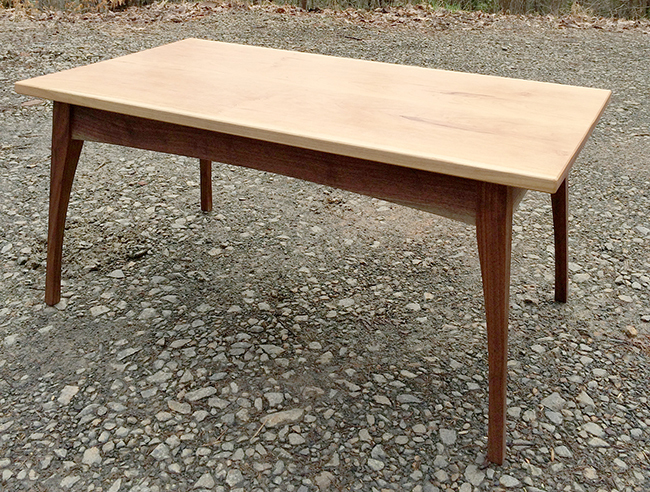 I talked to former Work/Study Elizabeth as she pondered what shape to make her table top. She said that one of the things she liked about the class was that even though all the tables were based off of John’s design, everyone could customize their table. Students chose different woods like walnut and cherry. 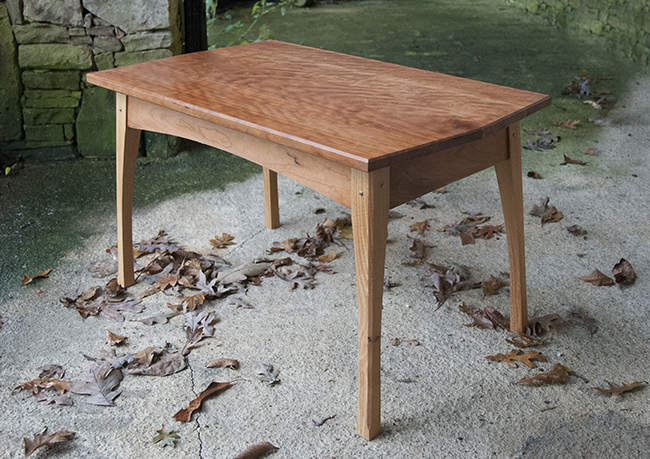 Some table edges and legs were curved, while others stayed straight. One student decided to make an extra tall table. The variety was subtle, but individuality definitely showed through in the end. (L) John Campbell and Elizabeth discuss design options / (R) Meghan uses a plane to shape her table leg. A local woodworker, John works on the Folk School’s Grounds and Maintenance team. He has been responsible for many of the woodworking improvements around campus. From collaborating with blacksmiths during Work Week, to assisting timber frame projects, to tackling solo projects like the new bridges and tables by Keith House, John’s presence on our team has definitely upgraded our surroundings. 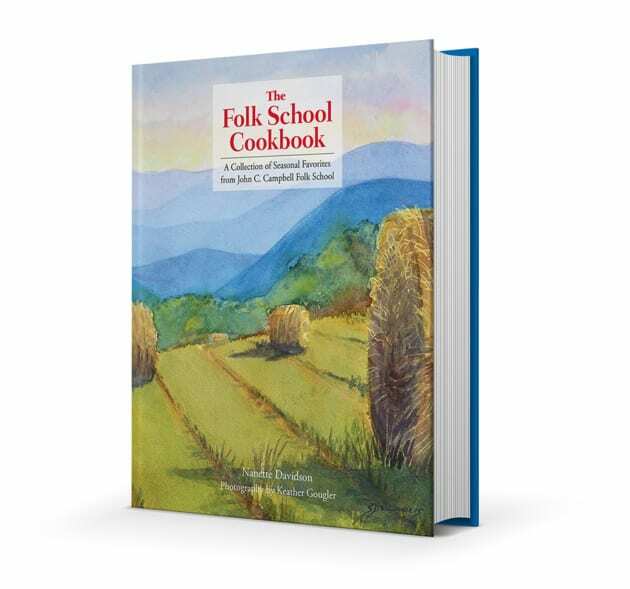 While John shares the same namesake of the Folk School, he is his own independent Campbell, unrelated (albeit perhaps distantly?) to John C. We are lucky to have him on our team! Look for more classes taught by him in the future. 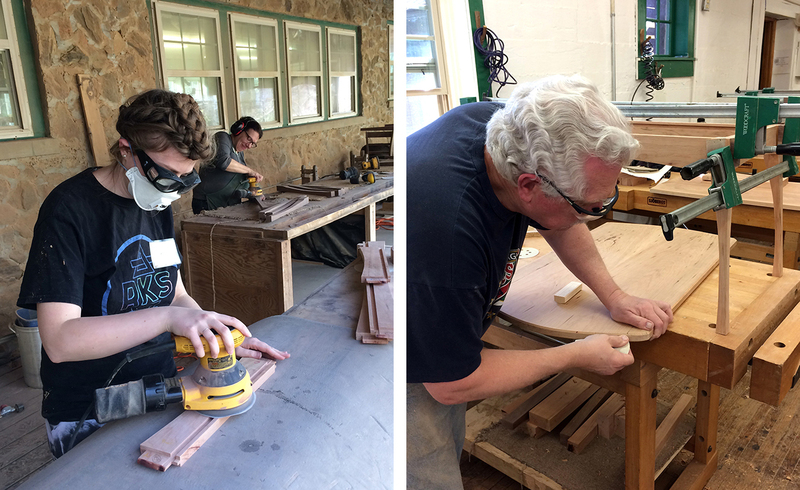 In the Folk School Woodworking Shop, there are many classes throughout the year that focus on a project like a chair, an instrument, a box, or a table. 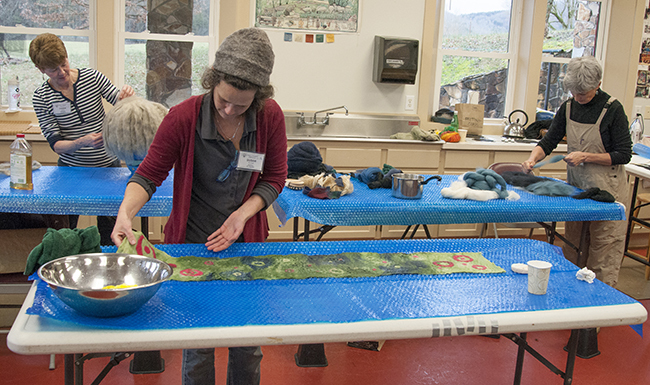 In just one week, under the guidance of a skilled instructor, you can create a family heirloom. View all our upcoming Woodworking Classes.